In this unit you will learn two fretted notes on the sixth string and dynamics. ‘F’ is on the third leger line below the staff. To play ‘F’, fret the first fret on the sixth string. ‘G’ is underneath the second leger line below the staff. 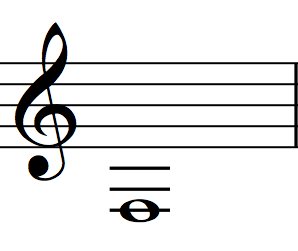 To play ‘G’, fret the third fret on the sixth string. The word dynamic refers to variations in loudness. 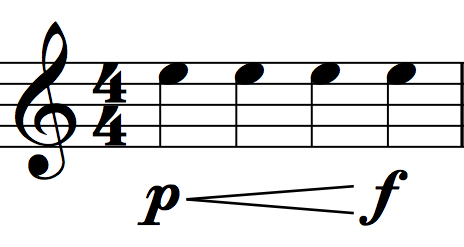 Since music notation developed over a vast period of time and place (and continues to develop) there are a few ways to notate dynamic. 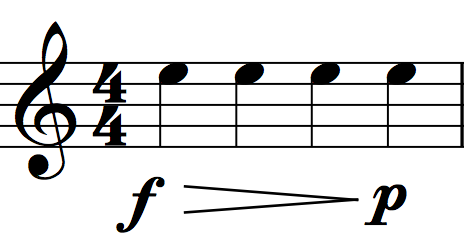 The dynamics in this section relate to the Italian words piano (soft), forte (strong) and mezzo (half). The list below includes the symbol, its Italian name and its musical direction. It is organized from the softest to the loudest dynamic. The crescendo, directs you to grow louder. The word means “increasing” in Italian. The decrescendo directs you to grow softer. 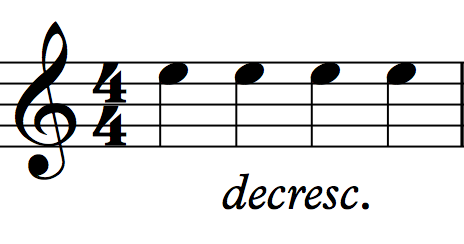 The word means “decreasing” in Italian. The diminuendo directs you to grow softer. The word means “diminishing” in Italian. Hairpins direct you to either grow louder or softer over time. They are usually placed under the staff and relate to the notation directly above. A hairpin crescendo that widens from left to right directs you to grow louder. A hairpin decrescendo that narrows from left to right directs you to grow softer. The sforzando involves a sudden and loud accent. It is short for subito forzando, which means “suddenly, with force” in Italian. 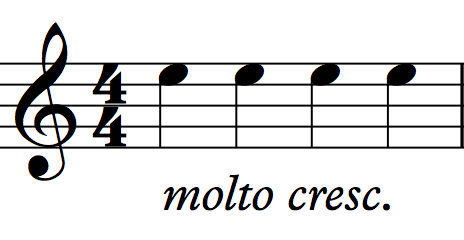 The molto is a modifier that is usually paired with another dynamic (as in the example above). The word means “much” in Italian. It directs you to enact a more dramatic change of dynamic. 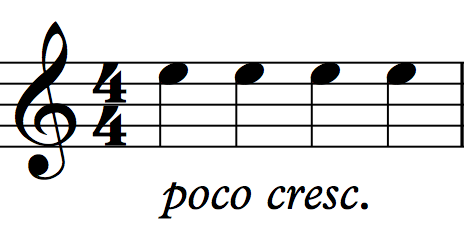 The poco is a modifier that is usually paired with another dynamic (as in the example above). The word means “little” in Italian. It directs you to enact a more subtle change of dynamic. The subito is a modifier that is usually paired with another dynamic (as in the example above). The word means “suddenly” in Italian. It directs you to instantly change dynamic. Dynamic changes force us to listen to the acoustic space, other players and our own playing. Attentive listening can create relaxation and exhilaration at the same time. Become acquainted with the diverse effects of careful listening as you sight-read.